1. What do missions mean for the Orthodox Church? This command of the Master constituted for the Church a continuous obligation. The Church must give its own witness here in this world and it should proclaim with words and deeds the saving message of the revelation of our Lord Jesus Christ. The goal of the Church is that it should bring the world into the Church and make Christians of all mankind. The Church, and I am speaking for the Orthodox Church, never made use of worldly methods in the application of its teachings and in the formation of converts. We do not try to use force or psychologically compulsory methods to spread the Gospel of Christ. Certainly it is true, unfortunately, that the Orthodox Church does not have an organized mission. Every local Orthodox Chruch is making an effort with their own criteria and with their own power to do a missions. If we should take into account the contemptable phenomenon of paralleled Orthodox jurisdictions which is observed in recent decades in America, Europe, Australia and recently Southeast Asia, then we are able to understand why non-christians see us as something similar to Protestants, divided into many groups, who competitively try to prove their missionary effort by their "successes". The things of which I speak are not an exaggeration and do not misunderstand my words. In the area of missions it is necessary to see things from the perspective of others. For they who are not Christians naturally have a different view and opinion about Christianity from us, who have had the blessing of being born and raised in a christian environment and a christian land. If we do not do this, then we will not be able to give others understanding of our missionary message and naturally our missionary labour, despite the hard work, will turn out fruitless. 2. How were you lead into missions, and at such a far away place? It is necessary to point out that when we talk about missions we do not understand it as being sent to those who are non-christian only, but also to those who have already been baptized as Christians. God lead the first young steps of my life to a monastic vocation and more generally to the service of the Gospel. When you live daily at a monastery the ascetic tradition of the Church and you live the Christian way of life found in the daily Services and in the contemplation of the Holy Scriptures and Holy Fathers, then you desire to preach the same realities of life to the armchair Christians and those Christians who are indifferent. The idea of what is known as foreign missions never had crossed my mind. Then I was seeing how many of our brothers and sisters in Greece who have been baptized Orthodox are completely uncatechized. And even today this is a reality. 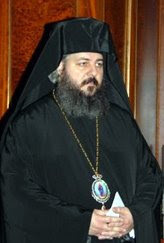 We boast that Greece is a Christian nation and that the Christians are 95% Orthodox. We rejoice during Holy Week when the sacred churches are full. Forgive me, but the rest of the year where are all those people? Are we not living in an imaginary world of our fantasies? Look around you and search to see how many there are who live the Christian life? Our Greece needs much work in the area of Orthodox catechism for adults. Also they need workers devoted with zeal. In Southeast Asia many times indigenous Christians ask me: “Why don't the Greeks not come every Sunday to Church”? They consider Greece a model and they are sorry when they see Greek Christians that are completely uncatechized. That I am found far away from Greece, I attribute it to the will of God. I did not flee from it. God called me and established me at this new bastion. Humbly I received this new calling and so I am found in far away Hong Kong. 3. How difficult is the work of a missionary in Asia? Orthodoxy in Asia is completely unknown. The people here know the Christian traditions which the Roman Catholics and Protestants carried here. These christian confessions also have organized missions. Of course these older missionary attempts combined their actions with the political colonization of the Great Powers and this combinination made the indigenous peoples to become very cautious with everything that is christian. The Orthodox missionary is coming to work within lands which have a different outlook and a different culture from which he is accustomed. There are no infrastructures to possibly support the work and there is certainly not the economic support. I say this because some who have created a dream-like image of missionaries. But the reality is different. How will a missionary in Southeast Asia live? Does they not have necessities like shelter and food? How will they conduct their mission? A mission also has practical necessities. How will they build a church? Who will pay for the translations, the publication of tracts and books, and thousands of other things? Also some think that the missionary is able to live like a beggar. Let them visit Hong Kong, Singapore or Taiwan and after they can review their same theories concerning missionaries. Besides these practical things there are also other difficulties for anyone who desires to engage in missionary work in Asia. There is the issue of language, the different mentality and culture, and the reality of religious fanaticism. And certainly the mistrust which stems from what these people suffered from the colonialists. I think that the presence of the Orthodox Church in Southeast Asia despite these weaknesses is a great miracle. 4. How do you begin a mission and in what sectors do you move around in? The same phenomena they saw in the initial apostolic years we are encountering today. I am referring to the work of the mission. In a certain regions of Southeast Asia, Orthodoxy reached people by those who went there to work. In another region some Orthodox clergyman determined to initiate a missionary effort. There is also the matter of those locals who learned of Orthodoxy via the Internet who then inquired for Orthodox clergy to visit them and catechize them. At this point in time, by God’s grace, we have in the Holy Metropolis of Hong Kong and the Far East 47 operating Orthodox communities of which 25 have a church building. The communities are worshiping in Hong Kong, Singapore, Taiwan, India, Indonesia, the Philippines, Pakistan and Malaysia. In Thailand, Shanghai, Peking and others there are not regular places of worship but we are making an effort to serve the Orthodox there on the Great Feasts. In the Metropolis there serves 32 clergy: 4 Greek, 1 British, 11 Indian, 9 Indonesian, 6 Philippino and 1 Pakastani. In the are of Masbate in the Philippines there is a female holy monastery with four nuns, and we plan to establish a new female holy monastery in Medan of Indonesia. The Orthodox believers in Southeast Asia are about 17,000 and we are not including the Catechumens who daily seek us in order to become Orthodox, and those who are Orthodox Christians yet conceal their religious faith because of their local [religious and/or political] situations. - 8 medical clinics in West Bengal in India (each clinic is staffed by a doctor, a nurse, a janitor and allotted supplies so as to have a pharmacy). - 2 medical clinics in Indonesia (staffed by two doctors and four nurses). - 1 dentist in Calcutta, India. - 1 dentist in Indonesia. - 1 orphanage in Calcutta with 180 girls. - 1 orphanage for destitute children in Medan, Indonesia. - 1 orphanage for destitute children in Singaraja, Indonesia. - 4 nursery schools (India, Indonesia, and the Philippines). - 10 elementary schools (India and Indonesia). - 1 high school (Indonesia). - 2 technical schools (India, Indonesia). - 1 advanced polytechnic academy with two departments in computer science and a business administration (Indonesia). - 1 theological seminary is found in Medan, Indonesia (the Greek language is also taught). - economic aid for the destitute. - weekly distribution of food, clothing and all manner of personal hygene products and medicine. - distribution of all manner of scholastic books to destitute children (for in the region of Southeast Asia there is no free education. The students even in public schools are indebted to withhold a small amount for tuition fees and the purchase of books). - visitations to hospitals and prisons. - the manufacture of small homes for homeless families. - psychological and physical support for abused women and stray children. - the protection of refugees. - humanitarian aide to regions where they are hurt by natural disasters. - scholarships for destitute students. - we provide educational support for illiterates (mainly in Pakistan). - drilling for water in underdeveloped areas in order to provide them with drinkable water. The Metropolis is responsible for the preservation, the equipment and the service of the institutions and programs as well as the wages for staff. The annual costs of all of the missionary and philanthropic programs comes near to 750,00 euros. So the Metropolis needs roughly 70,000 euros each month. 5. What difficulties and obstacles by any chance are you confronting? The difficulties are many. First of all we need trained clergy who will decide to dedicate themselves to give some time to missions. The indigenous priests need guidance and education. Also another big problem is finding financial means. The Orthodox parishes have either few numbers or are comprised of mainly poor people, and they consequently are not able to cover the costs of building churches or running missions and philanthropic programs. At this moment all the revenues of the Holy Metropolis are derived from gifts of friends of the mission. Do you understand, therefore, the stress and also the anguish each month when we make an effort to obtain the wages for the priests and the personnel of the philanthropic institutions, as well as the essential money for its preservation of the missionary work. The financial problem has an impact also on other activities. For example, on many occasions we are cancelling our missionary visits to scale back because we do not have the money to pay for airfare, or we halt the philanthropic programs by reason of lack of financial support. At the office of the Metropolis of Hong Kong we do not have necessary personnel because we are not able to pay wages, so we pay a bookkeeper from a large accounting firm to come two days a week. The rest that needs to be done we try to cover it ourselves, myself and Fr Constantinos, Chancellor of the Holy Metropolis. In these places it is not easy to find chanters. And certainly it is not easy to train someone. It will be necessary to send them to either America or to Australia where the English language is mainly used to perform the Services. But the cost is prohibitive for the Metropolis. I speak about these difficulties, but there is also the shortage of clergy, for most of the Sundays or Feasts I serve as the only priest. Other significant difficulties are the religious fanaticism and antagonistic behavior of the various appointed regimes. Imagine that in various power countries if they see religious objects or vestments in your suitcase then they stop you, in which case they have the choice to either confiscate them or prohibit your entrance into the country. Certainly in these countries you are not able to disclose the that you are a clergyman because they simply they do not grant you licence for entry. We also confront difficulties due to the different languages and culture. Imagine that the Holy Metropolis is called to missions in the 23 countries of Southeast Asia. And some of these countries like China and India have very ancient cultures and very ancient religious traditions. All these things mean that it is necessary to find the right manner to reach all the peoples and certainly to translate the liturgy and catechetical texts into the countless dialects. 6. The people that you have received to serve, what are their cultures, religion and traditions? As I have mentioned the Holy Metropolis of Hong Kong and the Far East has brought into action missions in 23 countries, from Pakistan to the Philippines. This means many different nationalities, cultures and religions. In many of these countries the dominant religions are Hinduism, Buddhism, Taoism and Islam. Christians of all confessions are a minority. And certainly Orthodoxy is unknown everywhere. In countries such as China the greater percentage of people declare themselves without a religion. And it is a fact that for many of them money is their god. I think however it is significant that they keep alive ancient traditions, customs and habits which resemble ours, such as the respect for those who have fallen asleep. 7. What is your vision for the Orthodox mission to Asia in the 21st century? The Orthodox Church has much to offer Southeast Asia. When the indigenous people become acquainted with Orthodoxy they feel a familiarity. They are aware that they have found the One, Holy, Catholic and Apostolic Church. But it is still necessary to know much more. The Orthodox mission is still in its infancy and unfortunately unorganized. I emphasize this, for it is from these wounds where it is necessary that the Orthodox Church in its entirety become healed. The Ecumenical Patriarch is making an effort, attempting with much energy to support the mission in different parts of the planet. It is a pity other Orthodox Churches think along ethnic lines and so the Orthodox do not appear united in the sphere of the mission. So if we desire a living mission then it is necessary to inspire and to prepare new clergy so they will offer their lives to this very intention and naturally to support financially these efforts which are taking place. I will mention one example. The Roman Catholics in Hong Kong have 180 priests! One hundred of them are missionaries, that is, they are from other countries and came to Hong Kong where they will work for a two year period. What are we Orthodox doing? 8. What are some ways to help the mission? There are many ways to help. First and foremost is prayer. To pray for those engaged in missionary work. Prayer is a necessity for the whole Church. Clergy are able to help by offering themselves to serve for three months as missionaries. Especially the unmarried clergy in Greece, are they not able to come for three months, not more, to visit some mission and offer their valuable help? We need people to do translations into English, as there is shortage of suitable helpers. Also we have need more practical items such as candles, charcoal, incense, water and wine for the Eucharist. Finally, a significant way for anyone to help the mission is with a financial offering. Hearing something so prosaic may cause some to be scandalized, but it is necessary to be realistic. The mission has need of financial support. I am heartily thank you for the zeal which made possible this opportunity to speak about the mission to Southeast Asia. May God bless you. May you remember us in your prayers. For the official website of the Metropolis of Hong Kong and South East Asia, see here. For more updated information, see here. For this interview in Greek, see here and here.